CHICAGO—The Saturday before Pride Parade, hundreds of self-proclaimed dykes took to the streets in a decidedly more grassroots style event to highlight gender and transgender oppression within the LGBT community. 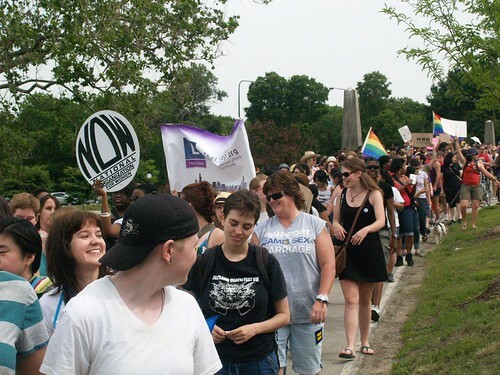 This year's Chicago Dyke March, organized by the Chicago Dyke March Collective, brought together nearly 600 lesbian, transgender, gay and allied folks for an unpermitted march through Chicago's South Shore neighborhood on the city's south side. The annual march is a precursor to the Pride Parade, and celebrates a lesbian community in Chicago that is without a Girlstown. Among the groups that participated in this year’s march were Gender JUST, The L Stop, Trans United, Join the Impact Chicago and Trikone Chicago. Martinez thinks one reason why the lesbian community is not as cohesive as the gay community is that the bar scene in Chicago isn't as accessible to lesbians. The L Stop works to promote events that often are not bar-related in an effort to highlight lesbian spaces and culture within the city. Martinez said she wanted to attend the march to build better connections between lesbian organizations. “We have to build these relationships with each other to know that we’re there for each other,” she said. Gender JUST Member Joshua McCool said there is still a lot of racial oppression within the queer community as well, and in society at large. The group’s Committee on Urban Resource Sustainability and Equity wants to reform many aspects of Boystown the group says are not inclusive of transgender and queer youth of color. McCool said the Center on Halsted (COH), which provides HIV/AIDS testing, is one such problem area for Boystown. “There’s been an issue with how [COH] has treated a lot of queer youth of color who come there for help,” he said. His organization is also working on changing how Chicago Public Schools (CPS) treat queer students through the Safe and Affirming Schools Campaign. The group is working toward a meeting with CPS CEO Jean-Claude Brizard set for July 14 to discuss the problems with the grievance policy within CPS. At Jackson Park the marchers enjoyed the food, poetry and music from queer and lesbian artists, and free HIV/AIDS testing.